If you’re not writing a Spring application, creating good integration tests for RESTful endpoints (or any other web service) isn’t always the easiest - especially when you aren’t working in a dynamically typed language. Rest Assured is a great library which makes the process a lot easier - it’s designed around use in Java, but of course we can use it just fine in Kotlin as well. In the following examples, a simple Kotlin web service written with Ktor and Exposed is tested using Rest Assured and JUnit. Note that this isn’t a simple unit test of the endpoint, an actual instance of the server is started up and tested via requests to localhost. Before we start getting into using Rest Assured, because Kotlin is being used, a couple function aliases need to be created because of some methods overlapping with Kotlin keywords. In this case when (which is pretty vital in Rest Assured) and a helper function taking advantage of reified generics in Kotlin to convert a response object to the type we expect for further assertions. In this example, all the concrete test cases which test our server endpoints will inherit from this base class. Because Ktor is being used, it’s very straightforward to start the server up at the start of the test run and close it down at the end. At this point we can also pass configuration options to Rest Assured (there are plenty to check out). In this case we just set the base url and port so that in our test cases we can use relative URLs which are easier to read - /widget instead of http://localhost:8080/widget. Because we also have access to any other source files in this base class, you can also define logic to setup the database as you would like in between tests - in this case, before each test we wipe the main Widget table in H2 to make sure every test starts from a blank slate. Now you can start using Rest Assured to test your RESTful endpoints (or any other web service really). Each test case is just a simple JUnit test so you get all the integration you would expect from using any another library. The base format is a given --> when --> then flow whereby first you define any entity you wish to use (in a POST for example), and then define your actual request with URL, followed finally by assertions on the response object. Rest Assured includes a lot of support for making assertions on the output JSON using JSON paths etc. However I much prefer using the to helper we defined above to marshal the response back to our DTO objects. Some might frown at this approach as you shouldn’t be reusing your domain classes in tests - but the response objects should take the same format anyway and I think we can agree that the test cases look a lot more readable this way. Plus as an added benefit, you get to use your good and faithful assertion libraries - my favourite being AssertJ. The below example shows testing out a GET request to our RESTful resource. The syntax is easy to follow, just create a GET request to the URL in question, make an assertion on the output status code and then extract the response body, converting it to a List of our model Widget class. Finally, just run assertions on the list to make sure it contains only the data you expect. Testing out POST requests mainly follows the same format, however in this case you start off with a given expression where the body entity is defined, alongside the content type (JSON in this case). After that, the only difference is the request method. In the exact same manner as before, the output is extracted and similar assertions are run. The Rest Assured usage guide is very comprehensive and gives a good overview of what Rest Assured can accomplish. In the examples above I have showed only the basic functionality - but to be honest for a lot of cases this is all your really need. The main differences you will see in other examples is that in a typical Rest Assured test, the body method is used to run Hamcrest matchers against certain JSON elements. You can also test forms, run JSON schema validations, test against XML and use JSONPath to access specific nodes. 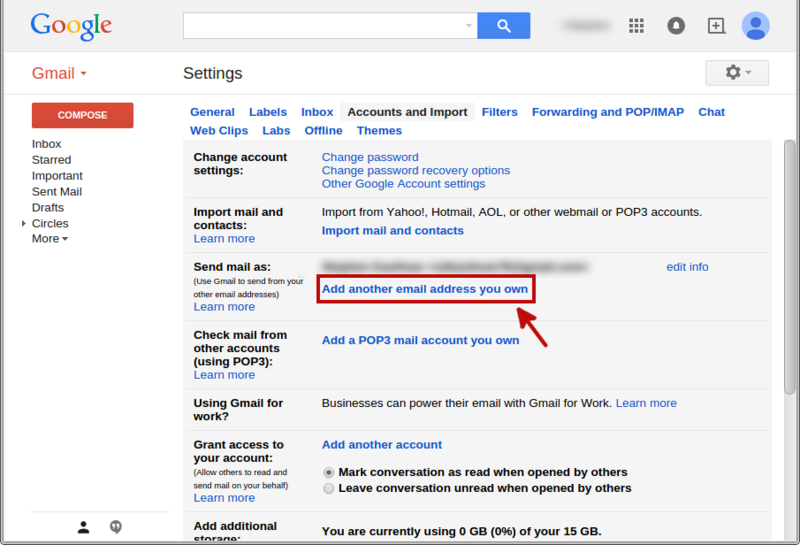 In the previous part we covered how to setup Postfix to receive emails for our custom domain name and forward them onto a personal Gmail account. With that solution, you can get access to all incoming mail via the forwarding, but you have no way of sending mail as owner of your domain. You could still add the address as a Send Mail As option within Gmail, but your underlying address would still be visible to the receiver. This is also how you see the Sent on Behalf Of message in Outlook etc. 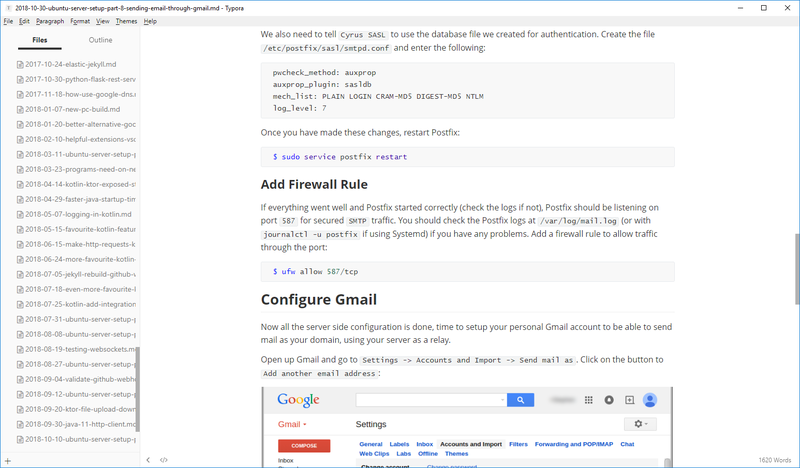 Ideally, we want to be able to send email in Gmail, but use our server as an intermediate. This is great because we can still use the Gmail interface and tooling without having to setup a real mailbox (Roundcube etc) on our server. To get the functionality mentioned above, we have to setup Postfix as a relay server (a server that will send e-mails to their destination on behalf of it). You might have heard that relay servers are a really bad idea, and they are, but only if they are open (a.k.a unsecured). In this case, we will be making a relay, but securing it with TLS and a username/password to make sure that all communication between it and Gmail is secured. This will also prevent bad actors from being able to send email on your behalf via your server. Here, we are enabling authentication using SASL and setting up TLS pointing to the new certificate. All traffic to the server must be sent under TLS as to be accepted by the relay. We also specify that we wish to accept relay traffic which is authenticated under SASL, and reject anything else (no open relay here). 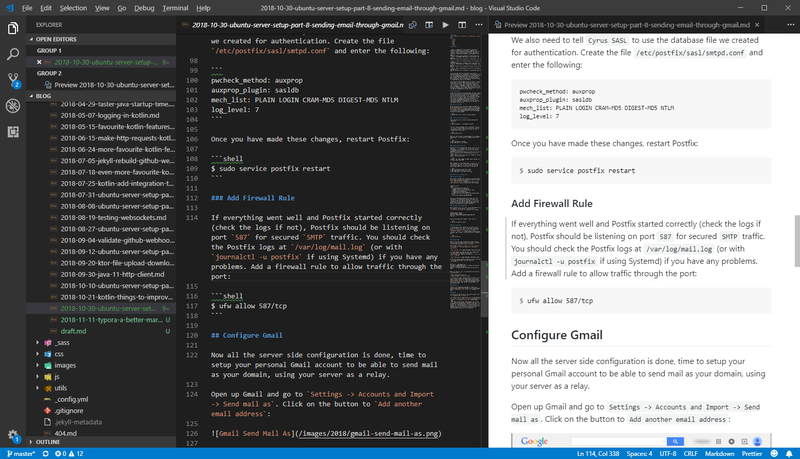 Now all the server side configuration is done, time to setup your personal Gmail account to be able to send mail as your domain, using your server as a relay. 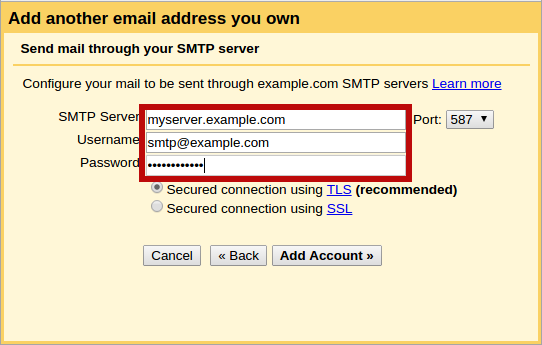 If all went well, Gmail should be able to connect to your server and will send a confirmation email to your new address me@yourdomain.com. Because we setup forwarding in the previous section, this email should appear in your Gmail inbox as well. Open the mail and copy/paste the confirmation code. Finally, start composing a new email or reply to an existing one and you should be able to select the new mail address me@yourdomain.com in the From dropdown. All done! All emails sent to me@yourdomain.com (or any listed in the virtual file) on port 25, will be forwarded on to you@gmail.com and be visible in your standard Gmail inbox. 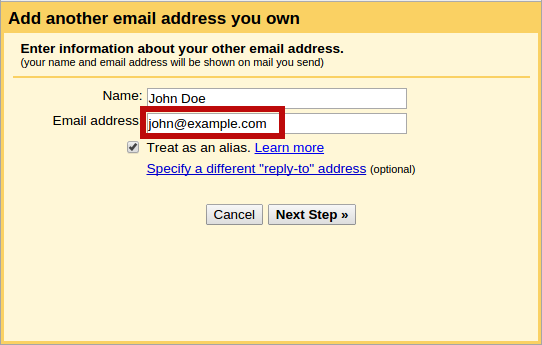 Gmail will let you select me@yourdomain.com as the From address when sending or replying to any mail. The message will be relayed onto our Postfix server with TLS on port 587 and then passed on to the destination. Any message sent in this fashion will look to the receiver as though it was sent directly by your domain and your underlying Gmail address will not be visible. This list isn’t very long and doesn’t exactly include any game breaking lack of functionality. A good testament to how Kotlin is a solid language these days. These are both hotly contested, but I personally believe they should be part of Kotlin. All the arguments against the ternary operator seem to revolve around being ‘too easy to abuse’. Yeah right. Kotlin has so many other language features which can be abused already (operator overloading anyone? extension functions anyone? ), I just don’t see why it’s such a big deal. Like it or not, Kotlin is competing against a myriad of other C based languages - all of which have the ternary operator already. Pretty much every developer knows it these days, it should be made available. val something = if(a < 4) "it's valid" else "not valid"
val something = a < 4 ? "it's valid" : "not valid"
Not many characters saved, true. However, when the times comes that I need one (yes because it has it’s place), I get angry at having to write the if statement - which is just more clunky to write. People are getting on their high horses and spouting the important of ‘language principles’ and not cluttering the language. Your language principles can be as solid as you want, but if nobody uses it, then what’s the point? Developers obviously expect these things - there is data backing it up. Is how I create my lists or perform inline conditionals that much of a big deal to not have both ways of doing it? I think the whole static and companion deal is a bit of a mess in Kotlin. When writing Kotlin on the JVM, the concept of static is still very much a thing, and in certain places still a necessity. 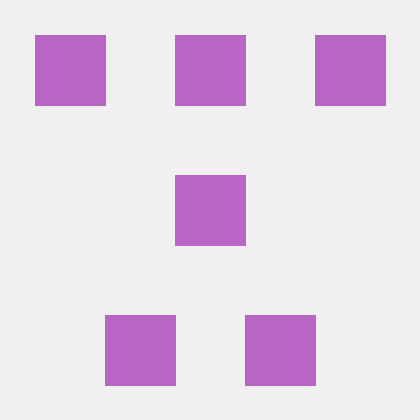 Want to create a JUnit method marked as BeforeAll/BeforeClass? Yeah, it’s just straight up annoying in Kotlin. To create a simple static method in Kotlin, you have to go through the hassle of creating a companion object, plus specially annotate the function to tell the compiler to actually make it static. In this case, Java is actually less verbose than Kotlin (and by no small margin) and for what gain? They can do better here to appease those on the JVM. Now, I don’t need static very often, really only for loggers/testing most of the time etc, but it’s such a pain to do the above that I prefer the other (less efficient) routes of logger per instance of or a top level variable. It seems like a bit of a tacked on feature to solve this kind of problems and ties into some of the efficiency problems discussed below. Static variables/methods are about as fast as it gets, turns out companion objects are the complete opposite. I don’t actually have any real data to back this up, but I think it’s common knowledge that the Kotlin compiler isn’t the fastest thing ever. To be honest I’m not too surprised, the amount of work it has to do is impressive. Nonetheless, when working on a Kotlin project and going back to Java, the compilation differences are noticeable to say the least. The Kotlin team have, and continue to do a lot of work to improve it though, so I hope it continues to get faster in the future. Aside from the compiler, I feel the need to rant about generally inefficiencies though. Maybe this is just a reason to moan about we seem to have accepted that it’s a good idea to use lambdas and streams literally everywhere. What happened to the good old for-loop? Things like streams aren’t free. Depending on what you’re doing there can be significant allocation going on and other overhead. Kotlin inline functions do a good job at resolving this, but they aren’t usable everywhere. There is a great series here which covers some of the hidden costs in using some of Kotlin fancy language features. As discussed above, when you define a simple companion object, the compiler generates a bunch of boilerplate and indirection. I just wanted a simple static variable/function, why do I have to have all this extra stuff (yes, really, multiple new classes get generated for this). There is a widespread movement towards immutability, which don’t get me wrong, has many benefits. But it also encourages so much inefficiency. Want to increment that one integer inside this object? Let’s copy the whole thing. Hardware continues to improve, yet developers and language designers seem to find a way to add another layer of abstraction to render it moot. 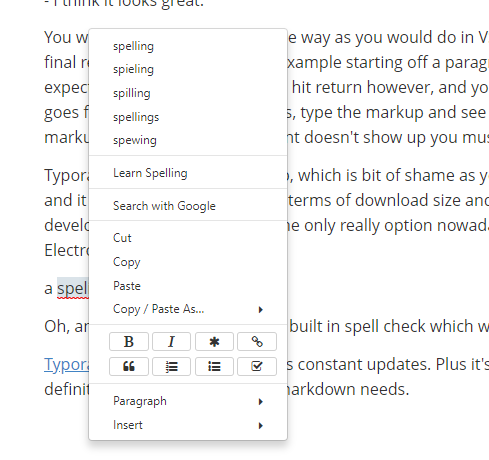 I’ve been doing a fair amount of work with Ktor and Exposed recently, and can’t help but think that extension functions are getting massively abused at this point (already). Don’t get me wrong, they are great and the syntax they allow for is a big selling point, but when you start using some of these libraries, you realise that everything and their dog is a top level extension function. Literally everything. Take the following snippet which defines a simple Ktor web service for example. The actual logic portion is nice and neat, but at the top we have 22 (!) imports. Kotlin has import * syntax, which the library makers tell everyone to use, but didn’t we previously agree that this was a bad idea? Something about having to ‘explicitly define your dependencies’ or something? But hey, as long as we get our nice builder syntactic sugar, lets just make IntelliJ fold it up and forget it ever happened.